An offer of holiday and educational accommodation for handicapped and healthy children with a view to art activities and nature. European Art Center for handicapped children Sněženka in Smržovka lies in a lovely countryside of the Jizerské mountains. The building of the Center is situated on the edge of the forest and it was extensively reconstructed last year and it has an easy-access. It is one of the largest easy-access facilities in the Jizerské mountains with its capacity of 22 beds. It is to serve to handicapped and healthy children from the whole Czech Republic and from abroad. 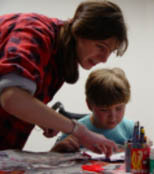 In week´s stays the children can paint, do ceramics, learn the basis of photography, weave, paint on glass and china and other techniques. The location of Smržovka enables to go for nice trips to the surroundings, in winter there is a possibility of downhill skiing on the slope Filip (5 minutes´ walk) that is artificially snowed and lightened for night skiing. Not far away there are cross-skiing tracks and a ski-center on Tanvaldský Špičák, lots of places of interest as the view-towers on Černá Studnice, Bramberk and Špičák, the sleigh-course (the only one in the Czech Republic), the spring of the Nisa river, the rack railway Tanvald-Harrachov can be found in the surroundings.